This is my 20th year here in Virginia Beach. I started out at Corporate Landing Elementary as an interpreter. I was there for 13 years. Then I was at Ocean Lakes High School for one year and then I came here to Corporate Landing Middle. When I was in high school, there was a deaf kid in my class. It was my geometry class and I was just fascinated with his interpreter and just watching that. I started talking to his interpreter and picking his brain about it and just took a liking to it. So I took my first unofficial class – it was an afterschool class at a hearing and speech center in Youngstown, Ohio – and after I graduated high school I decided to get my degree in it. Then, when I graduated college, I had no intention of moving. My brother was being stationed in Norfolk. He was a Navy SEAL and was finishing BUD/S and he got stationed here. He called me up and said, “Hey, Paul, do you want to move here? I’m going to buy a house. Do you want to come live with me?” I was like, “No, why would I want to leave my mom and all my friends.” That was huge and scary. 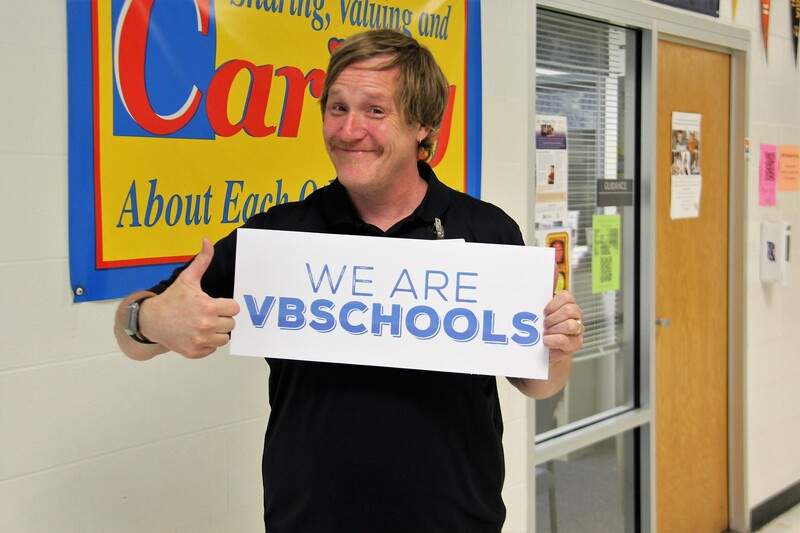 The next day was my last day of college – I was graduating, and so I walk into the room and there was a posting for Virginia Beach Public Schools, and I went, “Ohhh.” Then I felt in my gut that that was what I supposed to do. It was the best decision ever. It changed my world. In Virginia Beach, with the group of interpreters we work with, there is a tremendous amount of support. I hear of different stories in different divisions and everybody is really good at what they do, but Virginia Beach is extremely unique because of the amount of support that we have. The thing I love is that. When I first came here, I was really new. I had just graduated college. I didn’t have the skill that the group of people I worked with had. One of the things our boss says is: We grow our own. We’ll hire people and then work with them to develop their skill and make them better. The sense of camaraderie and support is overwhelming in this division. If don’t know how to do something, I go to my colleagues and we have a discussion about it. It really is, I think, one of my most favorite things of why Virginia Beach is so amazing to me: the sense of community, the sense of support and we just have each other’s backs. And in this division, as I hope in most divisions, our team is so centered on what’s best for the kids. Our boss, Becky, that’s her mantra: Are we making it about us or are we making it about the kids? It’s really important to keep it about the kids and what’s best for them. I have other jobs. I work another job with video relay interpreting through a company, and I just got another job which I’m really excited about. I’m working at a brewery. I’m working at Oozlefinch Craft Brewery on Fort Monroe. I just started that two weeks ago, this past weekend was my fourth shift – just pouring and talking. I know the owners really well. The owner’s wife was an interpreter in Newport News and Russel was a former police officer and he opened this brewery. My husband and I have been with them since the thought of it happened – since the inception to fruition. So we’ve been able to walk this journey with them so to be able to finally get the opportunity to work there – just part-time, seasonal – it’s given me something different to do. I also have two dogs that we spend a lot of time with and just hang out. Nothing really big. Just enjoy life.